If you give a three year old a muffin chances are that she’ll want to help you make them. So you let her help, and she will immediately pour milk all down the front of her. So you’ll send her upstairs to change her clothes. She’ll come back 27 minutes later in a pair of underroos and stripped leg warmers. You’ll send her back upstairs. She’ll come back with a matching pink tutu and a tiara, she’ll ask for a snack. You’ll remind her you are making muffins, because by now she’s completely forgotten. She’ll ask you what kind of muffins your making, you’ll tell her blueberry. That will remind her of Blueberry’s for Sal and she’ll run back upstairs to get it. You’ll go upstairs and find out that she’s screaming at her evil twin that lives in the mirror in her bedroom. You’ll remind her again that the mirror is simply a reflection of herself. 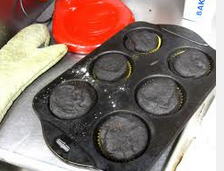 At this point the smoke detector will go off from the burning muffins you also forgot about. Your three year old will freak out and try to run outside in her underroos. You will hold her in one arm while climbing onto the living room side table to turn off the smoke detector. Right at that moment she will remember the muffins and want one really bad. So you will drive to Starbucks, buy her a blueberry muffin while you doctor up your vanilla latte to get rid of your raging headache. Love Blueberries for Sal and Love Lucy’s crazy antics! I am so glad you are turning into such an awesome baker…………..